- The Soundtrack of Our Lives with Outrageous Cherry and Pink Devil at Double Door - The Swedish rockers have been described as a mixture of The Who, The Kinks and Pink Floyd. Doors 9 p.m., show 10 p.m., $7, 21 and over. More info and tickets. - Alice Russell with The O' My's at Schubas - Russell is a British singer known for her powerful, soulful vocals and incorporating a variety of styles into her material. 10:30 p.m., $14, 21 and over. More info and tickets. 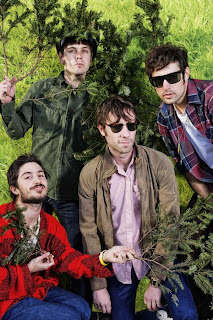 - Black Lips at Logan Square Auditorium - The garage punk band from Atlanta - notorious for their wild and unpredictable live shows - released their fifth album, "200 Million Thousand," in February. 8 p.m., $15, all ages. More info and tickets. - Human Highway with The Magic and Cotton Jones at Empty Bottle - Canada's Human Highway features former Islands members Jim Guthrie and Nicholas Thorburn.The duo's debut album, "Moody Motorcycle," was released in 2008, inspired by AM pop of the 60s and 70s. 10 p.m., $8, 21 and over. More info and tickets. - Fiasco with Rabid Rabbit at Hideout - Fiasco is a three-piece from Brooklyn that draws inspiration from punk and noise rock. They have released two albums to date, 2005's "God Loves Fiasco" and 2008's "Native Canadians." 9 p.m., $8, 21 and over. More info and tickets.